Aff(x)tion Forums – I created an account :DDD. It’s amberdextrous, but no one I’ve talked to seems to think it’s clever or anything ;_;. SOMEONE APPRECIATES IT, RIGHT? I know pr(x)tion does ;D.
Originally I just had “f(x) Photos” but that looked really strange lmao. I think they’re revealing a member every day, so I’ll be editing this post as stuff gets released~ And I read they have their showcase coming up and SNSD and SHINee will be there as well. YAY SHINee STUFF 8DDD. Profiles are taken from their soompi thread which I’ve linked at the start of the post. PLS DO NOT HOTLINK any of these pictures. 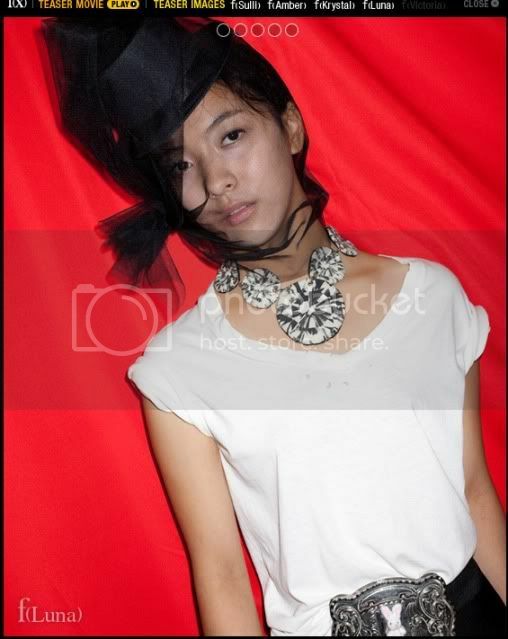 I uploaded them onto both photobucket and imageshack so if I get ugly frogs, I’ll be very … upset. First up is Sulli! She should be the group’s magnae – she looks it anyway. And a bit of interesting trivia, she’s the little girl from Vacation who played Mini-Yoochun’s love interest! (Do y’all remember that story? Mini-Yoochun was so cute, omg.) I knew she looked familiar but couldn’t figure from where I’d seen her from, until I read a comment on lj. Now I feel so relieved lmao. Amber is one of the two Chinese members (the other being Victoria Song). She hails from California and is fluent in English and Chinese. I wonder if she’s canto though because Chinese artists under SM are always mando haha. Anyway, not surprisingly (to me, anyway) she’s the rapper of the group (not sure if she’s the only one or not though). I actually think she’s quite pretty, just, in the second pic she looked like Lee Junki haha and it’s all dark and eerie. Everyone seems to be girl crushing her and turning lesbian for her lmao. 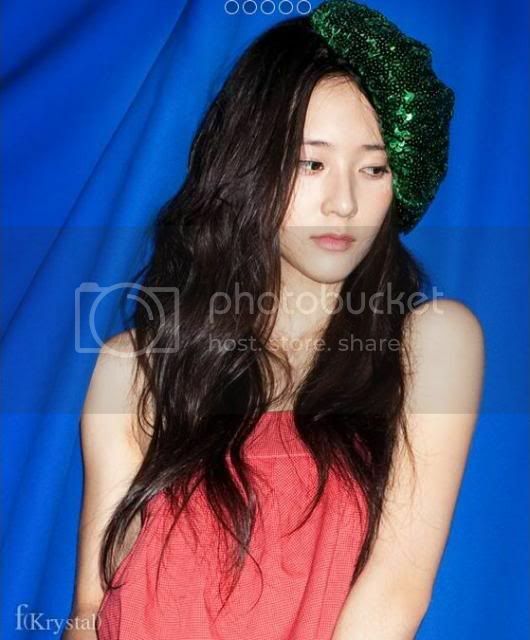 So, Krystal is the magnae of the group D: She’s only 14 yrs old, omg O____O. Sulli does not look any older than her. 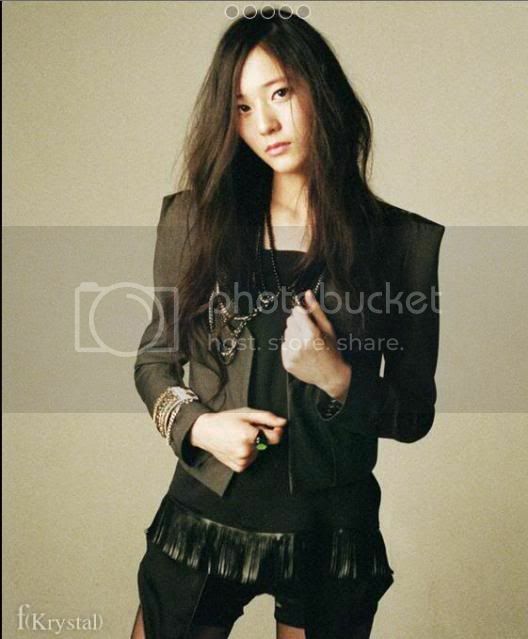 Krystal’s second picture is the only photo I’ve seen of her where I’ve actually seen the resemblance between her and Jessica XD. She can speak Japanese along with Korean and I’ll assume English, so this group really is quite the multi-lingual group, eh? Like U-Kiss haha. October 24th, 1994 / Jessica (SNSD)’s little sister. I keep thinking of Sailor Moon every time I see the word ‘Luna’. Gosh I miss that show :(. It seems, all of these members have received training for only about 2~3 yrs. Apparently they’re all extremely talented in vocal and dance which makes me really curious to see them perform, but at the same time I’m not holding high expectations because you’ll only be disappointed that way, right? I’m actually really interested in Luna. (She’s 16, btw – I feel so old ;_;) From the first released picture, I thought her side profile looked a little like Yoobin. Does anyone agree? I think it might be the eyes or something. She’s quite pretty, though the thing on her head is super weird; I kinda like her already haha! Victoria is gorgeous, ngl, but I’m not really a fan of her hair in these pictures :S. Their shoots have all been interesting though – I like that she’s got a teddy head on her head and stuffing in her hands. That’s something fierce lol. And I love it when people that we’ve seen before pop out of nowhere ^^ Yaay, she was so adorable – and still is. OMG. check the girl in the middle. is that Krystal Jung? lol. idk. She looks more like Yoona’s sister than Jessica’s lmao. f(x), seriously K-Pop artists names are getting more English and less interesting. I don’t like these “LACHATA” dolls except Amber, she seems to be the only different person because she is a “tomboy” or how SM has modeled her. Hopefully, they are the last K-Pop girl group to debut this year. After Super Junior, SNSD and SHINee and even though he is in a lawsuit with DBSK, he still manages to put out a new group. I think SM also put them out at this time so they can possibly win the Newcomer Award. I think they should stop trying to be fancy. I mean, just an English word is good enough, but they have to use numbers and symbols T__T. Yes please, but I doubt that will happen. But then again, any group debuting later than now will be at a disadvantage, unless they REALLY blow fandom away. SM no more! Gawd. You have so many sucuessful group already. Anyways, yay SHINee will be back soon~ :D I think Amber is too….tomboyish for me what bleh, maybe she’s better. But imo, Amber looks nothing like Donghae, lol. Just maybe the jawline, rofl. And…possibly the lips? Amber looks like a man, w/c is actually good b/c she isnt like the usual sugary type that sm produces. Good for her. I still dont like them. :/ i prefer sm focus on liyin. Yeah I like that she’s different, but as I was saying in an earlier comment, there’s so much emphasis on this image of hers that it sorta annoys me. But yeah, will have to wait til they debut to make a judgment :). And aww bb, it’s okay, I’d still understand even if you made mistakes <3. Lmao I…don’t think you’d be able to get away with that. I think it’s the jawline. Both Donghae & Jonghyun have the sexiest jawlines. I think I’m the only one who is not girl crushing her. I like my Jaebeom, Junsu and Taemin better. But I am starting to think that the teaser is growing on me. its growing on me too. you forgot to resize when you edited. Another girl group? Really? Doesn’t that seem a little tacky and uncouth of SM? Wait, how is Krystal the youngest when she was born in October and Sulli was born in March? Unless I just never learned my months correctly. January February MARCH ………… September OCTOBER November December? Yeap, Krystal’s definitely the maknae. 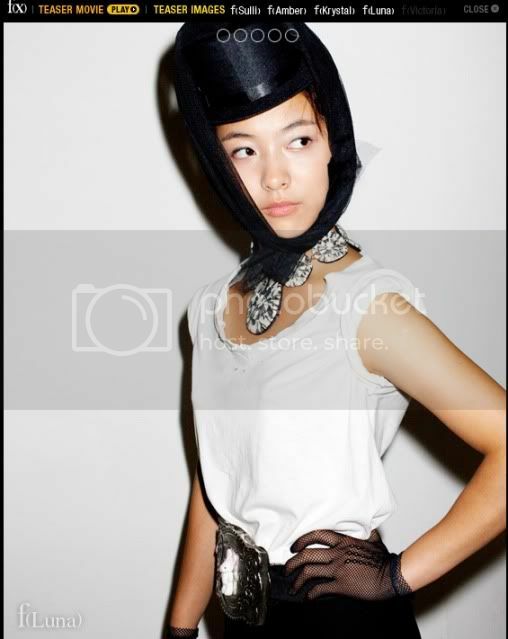 Even though Sulli looks the part more, lol! I can’t wait for September 2nd omg. And the meeting of lookalikes Amber and Jonghyun. Um, Krystal and Sulli were born in the same year and March comes before October, so then Krystal is the magnae? XD. Nope bb it isn’t just you :3. And Krystal is so Yoona and Yuri’s lovechild lmao. ^ same here, I am also thinking Amber does look like Jonghyun. I read on soompi somewhere about two witnesses that saw Amber. One said that they saw Amber and Krystal together walking around in that shopping district (Apujung?….if that;s not it then this is a FAIL.XD), and someone tried to take a picture of Amber and Krystal, but Amber grabbed Krystal, turned around, and walked the other way. Another one said that when Amber walked up to the store counter, she thought that Amber was cute and was one of those foreign asian boys. Then when Amber smiled at her, she almost fainted. (here’s the funny part) She said that she thought Amber was just a guy UNTIL……….. she looked at Amber’s chest and realized that he is a she. LOL Amber is making every girl go lesbo over her XDDDD!!!! I READ ABOUT THAT LMAO. I so loled at the store counter story HAHA XD. Lmao you should see me T___T. SM should stop bombarding us with bands for now… It’s getting kinda hard to keep up. Hello, they already have bands like DBSK (okay, complications there, but still…), SUPER JUNIOR :D, Shinee, SNSD… He already has the most successful entertainment company in Korea yet… ._. OMG I wrote a freaking essay. O.o Sorry for talking so much LOL. And for this reason, I really do feel sorry for them :(((. But ah well, this is the Entertainment industry for you. No don’t apologise, it’s okay, I love hearing different readers’ opinions :). I was poking around every single f(x)-related website cos I thought I was living in September 1st already, which is when the full song is supposed to be released. And thank you, I’m rather proud of my username :P.
No problem, thanks for the comment <3 ! thanks for the photos and info’s.. I’ve been to different sites and it’s really nice to see a different kind of “girl group”. hmmm,i love snsd and f(x)..so much!! I don’t care if they had plastic surgery,their songs is awesome and all of them are gorgeos!! Am i right? Amber is cool but im normal,not lesbo! Ok? Hahaha,but my point is im a big fan of snsd and f(x). Some of them are very young just like my age. Btw,saranghaeyo snsd and f(x)!! As for their names some of them are born with their name and others could have chose it themselves. So dont blame SM all the way. In any case I love Amber! I hope to see her in person so I can hug her and take a piccy with her! At first I thought it was one guy and the rest girls so I was really hyped for their debut, but then I found out I was wrong. I still love them though, if I was famous I always wanted my image to be tomboy like Amber. So wooh to her! well im a huge fan of f(x)!!! for the past like 2 or 4 weeks ive been listening to their songs nonstop and my sister gets really annoyed! but i dont care! some of my favorite songs by them are “nu abo”, “chu”, and “danger”. i think they stand out from other k-pop (korean pop) girl groups, like 4minute and girls’ generation, because they’re edgier and have major personalities. i think the one who stands out the most is definitely amber because of her boyish looks and tomboyish style. im so possitive that theyll be winning lots of awards in the future and making some major money from major hits! i hope to see them getting better but idk cuz theyre already the best, according to me!